A pair of plaster columns. Base is 21inches by 21 inches square; and columns have a 12 inch diameter. Priced listed is for the pair. 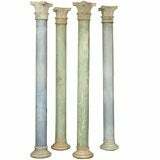 Set of four painted Italian Scagliola columns from Genoa Region. Will Split. $3000./each. Size:6 inches diameter. A pair of Architectural Fragments in White Marble. This pair is from a very old building in Italy. 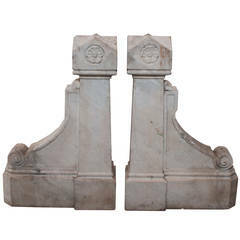 Pair of architectural salvage tall columns with original white paint. A couple of small spots of wrought. In original condition.